There are a lot of good Kung-Fu movies out there and there are a lot of bad Kung-Fu movies out there. The Warrior's Way is one of those movies that could fall somewhere in the middle of those ranges depending on your point of view. The movie opens with the Yang, played by Dong-gun Jang, who is a legendary assassin/swordsman working for an obviously corrupt lord. After many successful missions, Jang finally decides to turn his back on his master by refusing to complete a mission assigned to him. Naturally his lord is displeased by these turn of events and tries to assassinate Jang. This, of course, is impossible because Jang is so highly skilled. After defeating his lord's men Jang escapes to the Americas and hides out in the badlands. There Jang attempts to start a new life amongst the people he now calls friends. Kate Bosworth and Geoffrey Rush play local cowboys who befriend Jang as he settles into his new surroundings. As times passes and Jang starts to believe he may have successfully escaped his old life, it naturally comes back to collect. It's from here that we know what to expect to happen. Jang, with the aid of his new friends, now must fend off, not only a horde of evil ninjas, but also his lord and master. Visually this movie draws from what we've seen from most Kung-Fu movies of late. High flying, well choreographed stunts that look amazing quite frankly. And regardless of what else you may think of this movie, it can be said that the fight scenes are stunning. But that's all there really is in this movie, the plot doesn't add anything new to the genre, the characters don't really grab hold of you in any way, even our hero, and the movie itself looks a bit too cartoony. You can see influences from movies like 300, Sin City and Watchmen but what worked well for those movies just doesn't cut it this time around. Now there are a lot of Kung-Fu fans who may find a place in their hearts for this movie. There are certainly plenty of movies that have found a loyal cult following over the years even when most people think they don't deserve it. We could spend hours listing those movies. Why doesn't this movie deserve to be placed amongst all the other great cult classics? Again it is because this movie doesn't offer anything new to its genre. A movie like Big Trouble in Little China, or They Live told a unique story that was able to get into the hearts of rabid movie fans. The Warrior's Way just tells a story, a fun story this is true, but anyone can tell a fun story and it takes a special kind of voice to tell a great story. 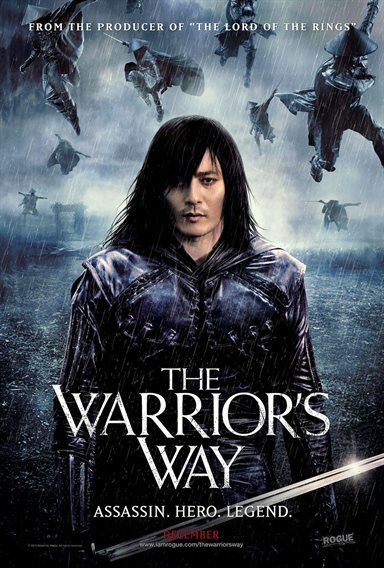 Download The Warrior's Way from the iTunes Store in Digial HD. For more information about The Warrior's Way visit the FlickDirect Movie Database.